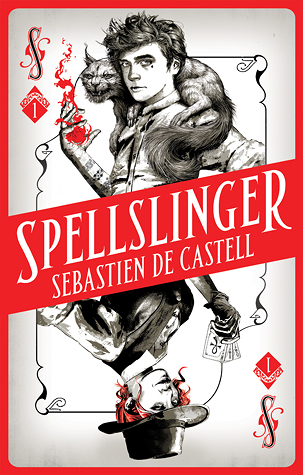 I picked Spellslinger up at the recommendation of Nazia from Orbit Books, who mentioned something called ‘squirrel cats’. I was intrigued. I was already reading half a dozen other books for reviews, but discovered it was crazy cheap on Amazon (I’m a sucker for a good deal on kindle books) so bought it. And promptly devoured it over the course of a day or two. The story has everything – brilliant characters, pacy plot, superb worldbuilding and a new take on magic. Oh, and a feisty, snarky squirrel cat called Reichis who might just remind you a little of Rocket Raccoon from Guardians of the Galaxy. We’ve all read fantasy stories where the young protagonist comes into their powers and go off to fulfill their destiny. This is the story of what happens when those powers don’t, but you’re left to get on with the whole destiny thing. It’s a YA fantasy with a wild west twist, a magic system which is intriguingly different, and some fantastic (and funny) banter between the characters. So, thanks Nazia for pointing me in the direction of Spellslinger. I’ve now got a few more books in the series to catch up on before book 4 comes out in October.